Introduced in 1994 the Red range of dynamic processors remains one of Focusrite’s most successful and recognizable hardware products. That classic anodized aluminium body with classic ‘ff’ detailing has been seen in studios worldwide and can be heard on countless recordings. With more and more producers creating tracks entirely ‘in the box’ the Red Plug-In Suite is a great addition to any engineer’s arsenal. During this review we will showcase what the Red EQ & Compression plug-ins are capable of by mixing a track using just these plugins*. Priced at £229.99 on the Focusrite website, this plug-in suite is currently free with with the purchase of any Scarlett, Saffire, Forte & Clarett interface. Now lets take a look at the original hardware processors. The Red 2 Equaliser is derived from the ISA 110 EQ circuits designed as an upgrade for the Neve console at Sir George Martin’s Air Studios, London. It boasts a flexible 3-band configuration with a high and low pass filter that has been explained as warm and smooth sounding. The Red 3 Compressor Limiter uses the same circuit topology as the ISA130 compressor module which is based around an innovative VCA design that earned Focusrite a TEC award for Outstanding Technical Achievement in Signal Processing Technology and is renowned for its natural sound. Keeping the same anodized aluminium design with the added warmth of the VU meter, these plug-ins are instantly recognizable and look great on screen. If you are used to tweaking the knobs on a physical piece of hardware you will instantly feel at home using these plugins. However for any producers who have never mixed ‘out of the box’ using hardware these plugins may seem a little limited in comparison to alternate plugins with additional features. If you are used to visually seeing your frequencies on screen and surgically cutting and boosting you may feel a little lost at first with these plug-ins. However this is by no means a bad thing. The Red 2 & 3 plugin suite will force any creative reliant on visuals to simply use their ears and achieve their desired sound, it just adds to the analog feel of these plugins. Now lets hear what these plugins can do in the context of a mix. You will hear a drum track, guitar track, vocal track and finally the entire mix with/without these plugins. To show off the transparency of these plugins the levels have been kept as close as possible between comparisons. The drum track prior to dynamic processing was quite close to the desired sound. However there was a lot of low end ‘mud’ and not quite enough punch in the kick and snare hits. Using the Red EQ the lowpass filter was used on each drum track to remove any unwanted frequencies and then the sounds were shaped as desired. Using the Red Compressor to heavily compress the drum hits achieved some serious punch. To help retain the original tone of the hits the parallel compression (mix) function was used to add punch without compromising the recording. Although subtle, the dynamic processing achieved using the Red 2 & 3 was impressive. Being able to add punch and attack to the drum hits whilst easily mixing in parallel compression makes Red 3 the go to compression plugin. The EQ plugin was able to boost high end frequencies to help the sounds cut through the mix without becoming harsh. Subtle compression was used on the electric guitars to help keep the levels balanced whilst accentuating some of detail within the recording. The bass was heavily compressed to keep the levels strictly balanced whilst smoothing the overall sound. 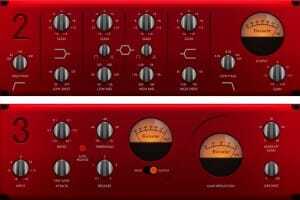 The Red EQ was used to filter out unwanted frequencies, boost desired frequencies and add air to the guitar tracks. No compression was used on the acoustic guitar. The Red 2 EQ plugin’s character really became apparent when using it on the guitar track. When boosting desired frequencies you can hear that although transparent, the sound achieved is smooth and doesn’t become harsh when boosting 8dB+. Compression was added to the vocals to not only keep the levels balanced but to bring out character in the sound and help bring the vocal to the front of the mix. EQ was used to remove mic rumble, shape the sound and add air. Using Red 2 & 3 on the lead vocal is where these plugins really showed off what they could do. The EQ was able to shape the tone whilst keeping a smooth transparent sound and the compressor complimented this by bringing out the character /detail of the vocal. Although each of these tracks have gone through subtle dynamic processing you can really hear the difference these plugins have made when hearing the entire mix. As you can hear, the Red 2 & 3 plugins have really helped enhance the recordings whilst retaining a natural sound that doesn’t appear to be over processed. Although the EQ plugin lacks the visual aspect of many todays popular EQ plugins it certainly has a smooth sound that doesn’t become harsh when boosting higher frequencies. Being able to stack this plugin on your channel strip to create additional bands helps when you really want to surgically cut/boost several frequencies. The compression plugin is a great smooth sounding soft knee compressor that is capable of achieving punchy drums and warm vocals. The mix knob is an amazing feature that allows instant parallel compression which should be on every plugin. The Red 3 achieved a warm smooth tone when used on the lead vocal that wasn’t achieved when matching the settings on Logic Pro’s built in compressor. So although it may not have seemed as transparent as the DAWs plugin, the Red 3 definitely had character that will make you return to this plugin. *Red 2 & 3 used for dynamic processing. Additional modulation and time plugins used. If you are after some new EQ and Compression plugins as an upgrade then the Red 2 & 3 plugins are a great addition to a producers tool belt. Priced at £229.99 or free when you buy any Scarlett, Saffire, Forte & Clarett interface makes this purchase a no brainer. As you know, you can never have enough gear so get yourself some nice Focusrite audio interface with their awesome preamps that comes with two great free plugins.